Boruto, Shikadai and Mitsuki arrive at the location they are told to go to by Shino. They notice their teacher is acting different than he usually does— and Shino suddenly attacks them! 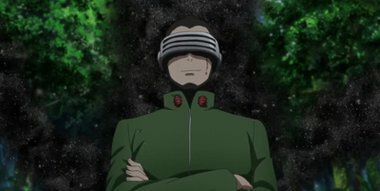 Shino belongs to the Aburame clan, a clan of Insect Users. He unleashes a swarm of Parasitic Insects. Boruto and the others can't match the skill of someone who's a jonin. But even in this situation, Mitsuki remains calm and coldly stares at Shino.